yum – an interjection used to express pleasurable satisfaction especially in the taste of food. – And the slow-motion word of the day on the Park City Food Tour. Whether it’s snowing or seventy degrees and sunny, its a perfect day to savor and sample the flavors of main street Park City. With more fine food than can possibly serve the small population of this silver mining town turned ski resort, Park City, Utah is a foodie paradise. From classic pub food to innovative and fresh small plates, the restaurant choices are palate pleasing. Plus they will just make you want to play harder so you can eat more! Our first stop of the afternoon, Wasatch Brewery (yes, you CAN drink in Utah!) served up more than just sudsy sips of their craft beer. 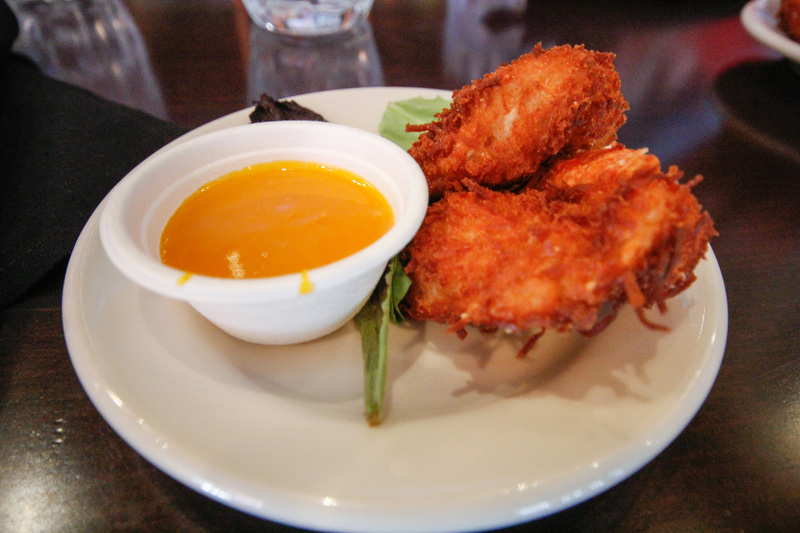 We enjoyed a beer-battered, coconut-crusted shrimp with a sweet and spicy mango dipping sauce! It was beautifully crispy yet delicate inside and the sauce really added something special to this easy opener. From tasty appetizers to full entrees, Wasatch’s brew pub has a little bit of everything for a hungry group off the ski slopes. In 1986, Wasatch Brewery became Utah’s first brewery to open its doors since Prohibition and today is a local favorite featuring staple beers like their Polygamy Porter, 1st Amendment Lager and Evolution Amber Ale. Oh-my was this next dish good! After walking slowly down Main Street from Wasatch and past the famous Egyptian Theater, where the Sun Dance Film Festival is held every winter, we popped into a quaint restaurant, Bistro 412. 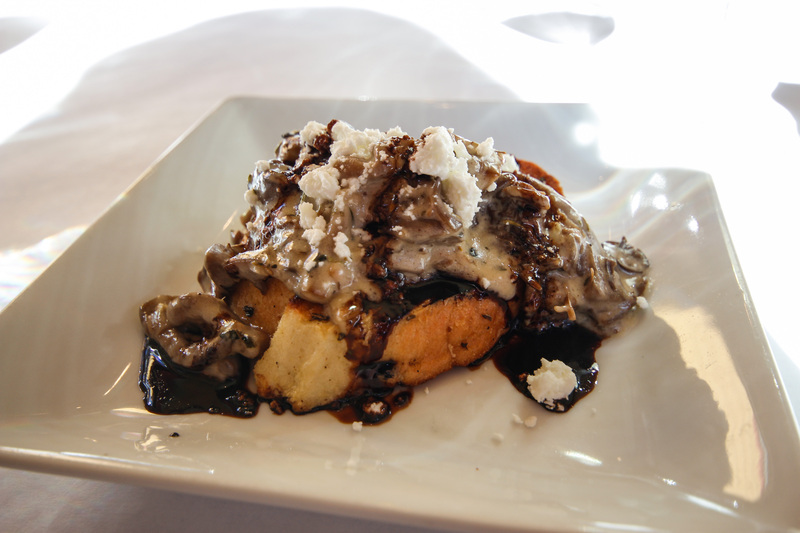 Plated for our second course of the day, we savored a savory, wild mushroom French toast topped with goat cheese, brandy cream and a balsamic reduction. While the photo doesn’t do this dish justice, the combo of flavors balanced perfectly with earthy fats and the sweet toast base. Overall a very cute spot, Bistro 412 serves delightful American-French fusion cuisine for lunch and dinner. From the plush studded couches to the tin ceiling, Taliskers on Main wraps you in a royal setting and than tranquilizes your taste buds with outstanding food. Voted the best restaurant in Park City three years in a row in Salt Lake Magazine, the former private club turned restaurant offers a touch of luxury to farm-to-table dining. We stopped in just before the restaurant opened to the public for dinner and enjoyed a sneak peak of the night’s specialty, a pork-beef sausage with grilled romaine, a citrus Caesar dressing and avocado puree. 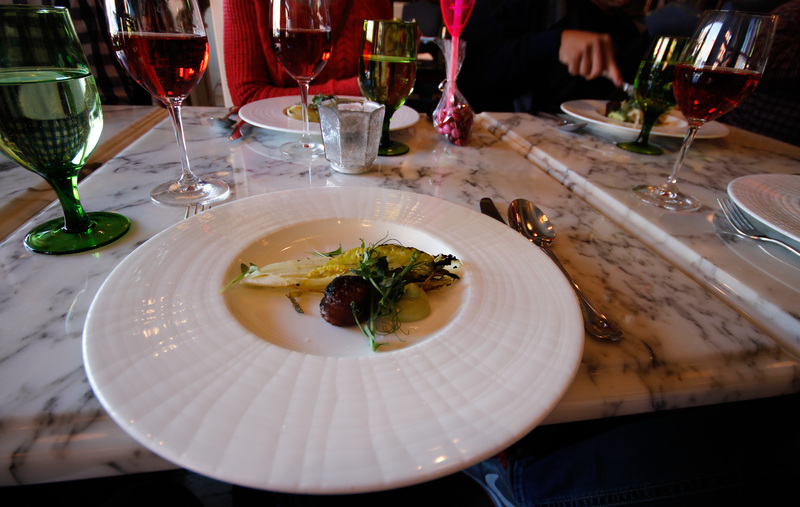 Paired with a dry rose, the meat was light and refreshing with the puree and the salad perfectly crisp. One of my favorite things about this restaurant stop though wa that from the dinning room you could watch the chef and his staff prepare all the meals – a dance of culinary beauty! For the last food stop of the tour, we wandered into the trendy and modern Silver. Dishing up seasonal food that tickles your taste buds, this place definitely held up to its reputation as a Sun Dance hot spot. 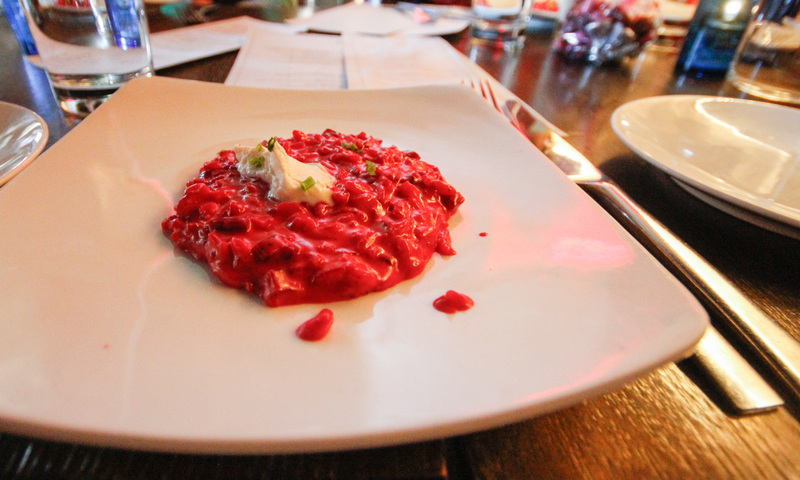 Sitting in a plush, blue-velvet waved booth, we licked clean a plate of sugar beet risotto with roasted chive and orange segments. Along side, we also tasted their famous pomegranate brussel sprouts, which I wish could just be delivered to my house every day! To keep things interesting, this restaurant’s menu rotates daily and you can even have one of their mixologists craft you a custom drink, bartender’s roulette! Finally, to finish off the night, our wonderful guide (and owner/operator of Park City Food Tours) presented us with a sweet treat for the road, a chocolate truffle by Bite Me Pastries and then we enjoyed a refreshing hand scrub and moisturizing at the Mountain Body shop to cleanse our heads after such a delightful meal. The best way to described this outstanding tour is with a big YUM! What type of food do you crave apres-ski? Back in March, I had the pleasure of visiting Park City, Utah for one of my other publications. Beyond the amazing skiing though, this city also served up sensational cuisine. So I thought I’d share with all my wine friends as well. Enjoy!